Gone are the days when you skimmed through radio stations on repeat, trying desperately to find something worthwhile to listen to. Now anything you are interested in — from quantum physics to stand-up comedy to stories of love and loss — can be found and listened to at the touch of a finger. What is this magical replacement to traditional radio? It’s known as a podcast, a term most people are familiar with nowadays. A podcast is, by definition, a an episodic series of digital audio files made available to download through the internet. Listeners can subscribe to their favorite podcasts and can listen either online or offline for ease of use. Better yet, they’re free! I’m sure many of you already listen to podcasts on a daily or weekly basis. They make your mundane drive to work much more interesting, stimulate your mind while you clean the house and keep you motivated while working out at the gym. But why are podcasts so popular? What makes people want to listen to them over their favorite new single or a traditional radio show? Let’s say you’re a writer of fictional stories, yet you’re stuck on the character development in a new novel you’re writing. By listening to podcasts that feature interviews with other fiction writers, you can gain insight into how they work from their own life, dreams, subconscious, etc to help develop characters in their own stories. In turn, you can use these ideas to help gain inspiration from your own life. Have you wanted to travel the world? Build a non-profit organization? Live a more sustainable lifestyle? There are plenty of podcasts that feature interviews with activists, adventurers and small business owners that can help inspire you to live the life you’ve always dreamed of. Recommended podcasts: TED Talks Daily, Nobody Told Me! Think of all the time you spend commuting to work, or going on your daily run, or even cleaning the house (yikes)! That’s a lot of time that can be used a lot more effectively. By listening to podcasts while you drive, run, or clean, you’re making optimal use of your time. Did you major in business, but always house a secret love for sustainable agriculture? It’s easier than ever to expand your knowledge on any subject imaginable with the wide range of podcasts available. You can listen to new advances in technology, strange scientific discoveries and the best strategies to market your business or start a homestead. Spending too much time listening to the news can get depressing. To add a new dimension to your daily news, podcasts offer interesting debates that allow you to see issues from both sides and develop your own view of the problem. Podcasts often go much more in-depth into an issue than your traditional news source does, and add in a bit of entertainment value while they’re at it. If you’ve been feeling a bit down, there are plenty of self-help style podcasts that can bring optimism and clarity back into your everyday life. By listening to how others have overcome challenges, you can dig yourself out of that rut and gain hope for the future. If you have a strained relationship with a family member, a romantic partner or a friend, it can be difficult to look at the situation objectively and try to find a way to solve the problem. By listening to interviews with others who have dealt with similar situations, it can help bring clarity to your own issues and may give you the insight you need to solve them. Sometimes it can be difficult to move vertically instead of laterally in a career. If you feel as though you have tried everything and can’t seem to get that next step up, listening to stories of other people in your field may help. There are plenty of inspirational podcasts that showcase people who have built themselves up from the bottom. By listening to these stories, you can gain ideas on how to progress in your own career. Even if you have hundreds of ideas swimming around in your head, it can take a lot of self discipline to set goals and complete the necessary steps to achieve them. 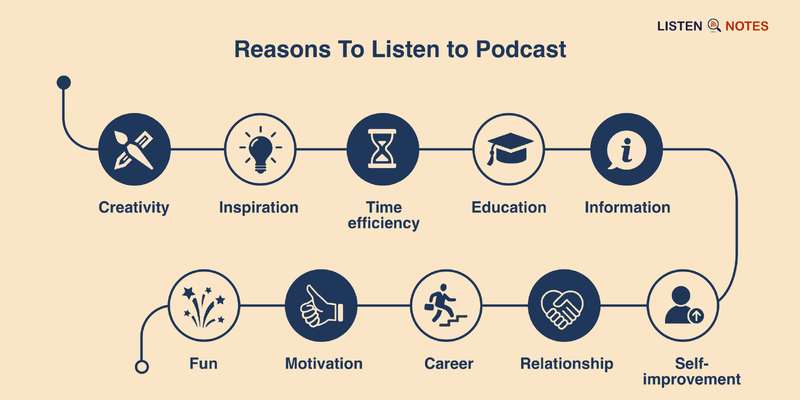 By listening to motivational podcasts, you can gain the optimism and motivation needed to make each day count. If you’re simply out to relax and have fun, you’re in luck! There are a wide variety of podcasts that feature comedians telling stories, getting involved in hilarious debates, and making difficult topics lighthearted and fun. Regardless of whether you are 20 or 70, male or female, a free-spirited hippie or a strongly motivated businessman, there is a podcast out there for you. They’ll make you laugh and cry, get motivated to move forward in your career or give you the insight you’ve always needed to make a big life decision. The sheer number of podcasts these days can make it difficult and overwhelming to know where to start. A great podcast search engine like Listen Notes makes it easy to browse by topic, search by keyword, or skim through the most popular! Before long, you’ll likely find yourself playing a podcast whenever you find a silent moment.